We would be honored to have you attend Amazon Vida’s Annual Banquet to celebrate another year of ministry. This will be an exciting evening of fun with DOVE Award winning comedian Mike G. Williams and our guest speaker Pastor and Amazon Vida director Elmer Lessa. We can’t wait to update or friends on the work that is going on in the Amazon on mission trips, in our seminaries and the growth of our new churches that have been built in the jungle. We also want to share with you the opportunities that God is allowing for new unreached people to hear the gospel. There is no cost to attend and no minimum contribution required. 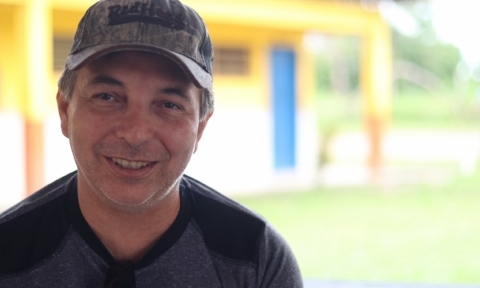 We want you to come, be inspired, and learn more about the work of God on the Amazon. Everyone is welcome to attend, just RSVP by AUGUST 13TH so we’ll know to set a place for you. When you RSVP please let us know if you are sponsoring one or more tables. If you sponsor a table we need an RSVP for each person that will be at your table. Can we count on you to fill a table of eight? As a table sponsor your role is to introduce a new audience to the ministry and work of AmazonVida. We need individual and business table sponsors to help us get the word out about this fun and informative evening. You can have a great impact on the success of our fundraising efforts. Please prayerfully consider being a sponsor and encourage other businesses or individuals that could help. It's more fun to have a table full of your friends. Can you help us by filling a table(s)? Thank you! Your interest in AmazonVida is greatly appreciated. This event is made possible through underwriting support from community businesses and organizations. Sponsoring a table at our event is a great way for your business to show that they care about the needs of the unreached people in the Amazon River basin. We have ambitious plans to expand the ministry but we need your help. Whether it be training leaders, putting in water wells, helping start new village businesses, or providing medical/dental care, with your help we can extend the ministry to villages that have not been reached. Platinum $500 - ½ page advertisement in our program, Logo banner at the banquet, Mention from the podium, Mention in social media and website. Thank you! We will contact you soon to discuss being a business partner. You can sign-up and give online. Thank you for supporting AmazonVida as a table sponsor for the Second Annual Banquet. We want to make this commitment easy for you, so we have compiled some helpful information below. We hope your role as table sponsor is both fun and rewarding and that you and your guests learn something new about us! We are thrilled to have your support! You are giving your family, friends, neighbors and work colleagues the opportunity to support AmazonVida's mission. By bringing new people to the banquet you are expanding our community of supporters essential to the growth and stability of AmazonVida's mission. The banquet is free to you and your guests. Although everyone will be asked to consider a contribution, there is no minimum and no maximum gift level. It will be our job to inspire your guests to give. Use our videos and pics to help cultivate interest in AmazonVida. • Verify dietary requests were made at registration (options: dairy-free, gluten-free, vegetarian). The meal will be completely peanut and nut-free. • Submit any missing contact information for your guests. • Your final guest list should be submitted so seating arrangements can be made. • Remind guests there will be an opportunity to give during the program. Remind your guests that they can make their annual tax credit donation at this event. • Consider ways to personalize your table at the event: small tokens of appreciation and/or thank you cards set at each guests’ place before they arrive are a special way to show your gratitude for their support. • Encourage guests to review the program and begin enjoying their meal. Centerpieces are for sale – collect the separate donation envelope with packet. Should your centerpiece not sell, please enjoy it as our thank you. • Introduce guests who are interested in learning more to AmazonVida staff and board members.